Selected for its topicality. It is this time of year that we are most likley to be able to find out about it. 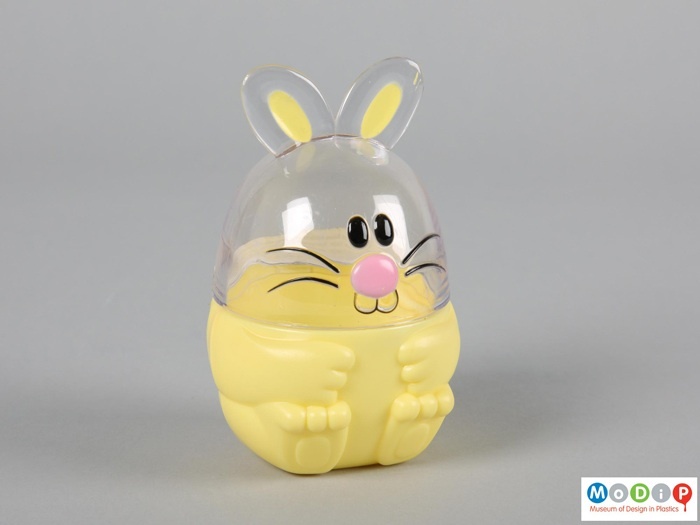 A plastic egg-shaped-rabbit container, with a yellow base and clear top section. The rabbit features include protruding ears, a printed pink nose, black eyes, whiskers and the outline of two front teeth. Funny Bunny pot AIBDC : 005619 Amazing how little is required to suggest a rabbit especially at Easter. What do you think of this charming creature? People really liked him on twitter even though all his chocolates have been eaten. Submitted by Susan Lambert on Fri, 18/04/2014 - 12:56. Have you seen one of these before? If you have, please tell us about it.